Writing for 7iber.com, American Sam Bollier poses the following questions and examines the Jordanian blogosphere and its influence on the political discourse in Jordan, by studying four different aspects that affect bloggers (access, ability/willingness, publicity and political culture). 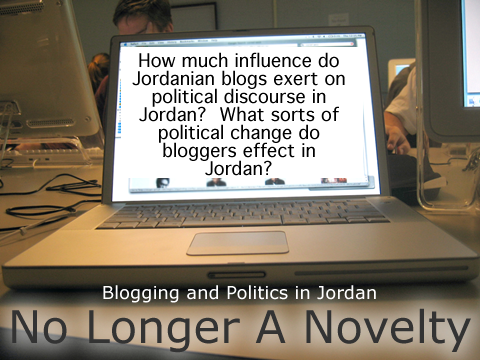 How much influence do Jordanian blogs exert on political discourse in Jordan? What sorts of political change do bloggers effect in Jordan, and why is the Jordanian blogosphere tepid in comparison to many of its Arab peers? had a clear-cut influence, it seems fair to say that, at the moment, the primary impact of Jordanian blogging has been on intangible processes that are intrinsically difficult to measure. Ohoud (Arabesque) shares her experience visiting the music conservatory in the West Bank city of Ramallah, Palestine. Walking through the narrow alleys of Old Ramallah, past the tightly fitted houses we finally found it. It was a gem. Yeah, it was. Back to the gem. It was yet another old house but not quite the ordinary one. In the middle of old Ramallah, stands the new conservatory to teach music, Al kamandjat. It is a dream realized by Ramzi Aburedwan, who spent his entire childhood in the Al-Amari refugee camp in Ramallah. He then went to Angers , France to study at the Music Conservatory. His objective was to establish music schools for Palestinian children, favoring the most destitute children, those living in the refugee camps. Archeology is not only historically interesting, I have learned – it is also a political, economic, and cultural force in this region. The Jordan valley and Mesopotamia hold the remains of some of the earliest beings on Earth. I say “beings” very purposely because these sites date back so far (more than a million years) that the definition of “civilization” or even “human” is called into question when trying to describe these places. One of the archaeologists today (Susan, who has been running digs for more than twenty years) described uncovering layer after layer of different existences, piled atop one another. Imagine. This act can become very political, for example, if you look at Israel-Palestine. Archeology is being used to make a case for who was there “first,” and thereby rightly possesses the land. As a result, there are accusations of some artifacts not being properly observed as the search goes deeper for the truly “original” inhabitants. People use archeology there to try to prove or disprove religious history as well. The Western new year in Amman is a cause for celebration (and January 1 is a national holiday), but it is not the wild debauchery that we're used to in the States. Many of the classier bars and restaurants have New Year celebrations, but these are 40-50 JD minimum to attend, and didn't seem worth it to me. I didn't have any plans for New Year's Eve until that very afternoon, when happily some friends decided to have a party. At any rate, I rang in the new year laughing, which is what matters to me. The party was lovely. When I think that at this time last year I was still an undergraduate student, and now I am celebrating 2008 in Amman as a Rotary Scholar with people from Jordan, America, Australia, Germany, Iraq, and even Saudi Arabia, among others, I can't even believe my good fortune. Quite simply, this year is changing my life. There will always be the time “before” Amman, and “after” it.